Pine nuts, also known as pignoli, pinon nuts and sometimes Indian nuts, are the edible seeds of pine trees, found in the genus Pinus. These seeds have been used in the cuisines of Europe, North America, and Asia for thousands of years, since they are high in protein, dietary fiber, and flavor. Some traditional recipes call for pine nuts, often toasted to bring out their distinctive taste, which is, for lack of a better word, very nutty and buttery, hence they are added to some salads and are also used in making the famous Italian pesto sauce. Italian pignolia cookies are also made using pine nuts as the main ingredient. The pine nut oil which has a very strong taste, hence is used in flavoring many vegetables and salads. Most markets carry pine nuts, which can be an expensive specialty item, so it's worth it to shop around before purchasing pine nuts. Trees in the Penaceae family, which includes pines, produce characteristic cones to reproduce. The hard and often spiky cone protects the tender seeds inside from predators until the cone cracks open, depositing the seeds on the ground. Many pinecones must be heated to crack, which is why pines flourish after a fire. Of the numerous species of pine tree, around 20 produce seeds which are large enough for humans to harvest. In Europe, most people use pine nuts from the stone pine, an abundant species which produces large, plump, ivory colored pine nuts. The nuts are especially popular in Mediterranean countries, particularly Italy, where they are thrown on pizza, ground with sauces, and added to pasta dishes. Pine nuts are also eaten out of hand. Roadside stands in places like Sicily and Greece commonly offer toasted pine nuts twisted up in large paper cones for people who enjoy their pine nuts straight. Numerous Asian varieties of pine produce usable pine nuts, a popular ingredient in China and Korea, among other places. In the Americas, pine nuts are harvested from the pinyon pine, and they may be known as "pinyons" in a reference to the parent tree. The exact nutritional profile of pine nuts varies, depending on the species, but they generally contain a high amount of protein, rich fat, and fiber. Some pine nuts also offer additional vitamins and minerals. To harvest pine nuts, producers must first crack the pine cones, typically with heat. Then, the pine nuts themselves need to be shelled. After shelling, pine nuts have a short shelf life, because of their high oil content. 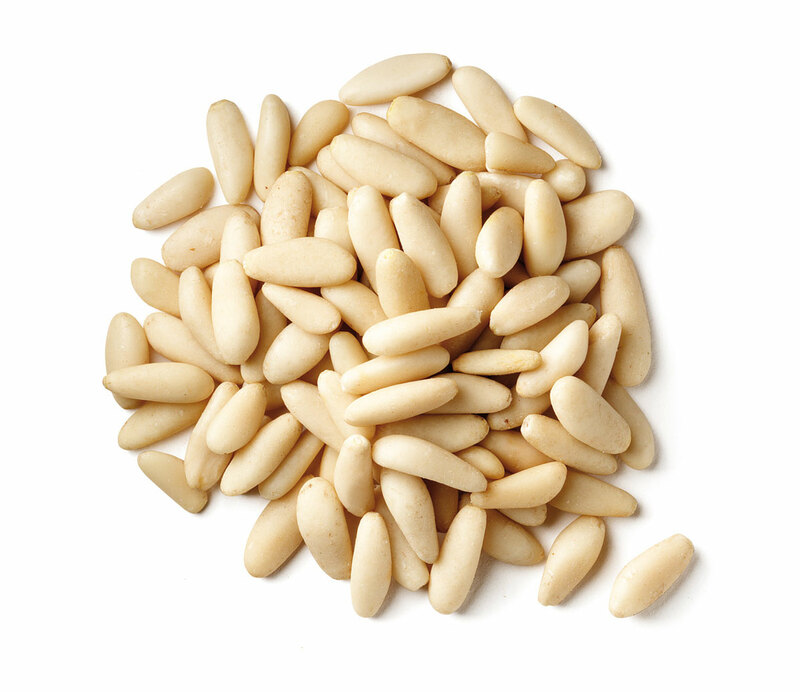 To keep pine nuts from going rancid, you should store them in the fridge or use them quickly. You can also purchase unshelled pine nuts in some parts of the world. Unshelled pine nuts will also be less expensive, since less labor was required to bring them to market. As you will see, pine nuts contain most of the vital nutrients required by our body. They are also a good source of zinc, vitamin B2 and potassium. To move on to the nutritional benefits of pine nuts, let us take a look at what exactly the pine nut consist of. Like walnuts, peanuts and many other nutritional nuts, the pine nut also contains minerals like magnesium and iron, phosphorous, niacin, riboflavin, thiamin and Vitamin and also some essential amino acids needed by the body. Some of the pine nuts nutritional benefits include, suppression of appetite, antioxidant protection, cardiovascular health maintenance, etc. One of the signs of aging is 'free radical damage', which means premature aging of skin due to minute chemical particles called free radicals. This is caused by diet, stress and other factors. Pine nuts consist of a number of antioxidants such as Vitamins A, B, C, D and E, and lutein which act as mega-vitamins and help protect cells from free radical damage and also improve vision. Cholecystokinin is a hormone that act's as an appetite suppressant has its source in pine nuts. They also contain pinolenic acid that enhance other hormones, which act as hunger suppressors and hence the pine nuts nutrition is found to give energy as well as reduce hunger. Pine nuts nutrition contains 1-5 g of fiber which reduces abnormalities like constipation and toxicity, by helping in regular bowl movements and keeping the colon walls clean. Oleic Acid, a mono-unsaturated fat, which controls cholesterol levels, is also found in pine nuts and this helps in reducing the effects of certain diseases. Vitamin K plays a major role in blood clotting, releasing menstrual cramps and improving circulation. Pine nuts are very rich with this vitamin. Minerals such as magnesium (17%), zinc (11%), iron (8%), and copper (17%) find their source in pine nuts. Pine nuts show rancidity, faster than any other nuts, hence they should be stored in air tight containers and refrigerate in the freezers. But as their shelf life is not more than three to four months, try finishing them before that. Pine nuts are expensive, yet have a huge market in the US. To increase the storage, pine nuts can be roasted in an oven or on top of a stove. There's no better way of enjoying pine nuts than eating them raw or even crushing them into salads and vegetables or simply enjoying a healthy, hot soup which provides all the nutrients needed by our body. Pine nuts contain the highest amount of proteins, found in any nut. Pine nuts are the only source of pinoleic acid, that helps in stimulating the hormones that act as appetite suppressants. A handful of pine nuts have enough pinoleic acid, that can stimulate the intestines to produce hormones called CCK. This CCK signals the brain to turn off the hungry mode. Thus, slowing down the stomach's rate of digestion and giving you a feeling of full stomach. This is great for those who are watching their weight or are dieting. Pine nuts are also the only nuts with highest concentration of oleic acid. Oleic acid is a mono-saturated fat that helps the liver to eliminate harmful triglycerides from the body. They are also great for your heart, as they contain the same mono-saturated fats as in olive oil. They help reduce cholesterol and protect the arteries from damage, thus preventing heart attacks. Pine nuts have high antioxidants, that help protect the cells from damage due to free radicals. They are power packed with iron, that helps in increasing the hemoglobin level of the blood. Pine nuts also contain magnesium that helps in reliving muscle cramps, fatigue and tension. Pine nuts are extracted to produce oil, that is very famous for its nutty and mild flavor. In southwest America, a special coffee known as 'Pinon', is made from pine nuts. This is a dark roast coffee. that has a deep, nutty flavor. They are regularly included in fish recipes, vegetarian recipes and meat dishes as a source of dietary fiber. With the above information on pine nuts health benefits, I am sure you must have found your answer to the question 'are pine nuts healthy for you?'. If you are trying to lose weight and need to maintain a healthy diet, do eat some pine nuts. These health benefits of pine nuts will surely prove to be a healthy choice for health conscious people. People with allergies to peanuts or other nut allergies can have an allergic reaction to pine nut. The Department of Alergologia e Inmunologia Clinica at the Clinical University of Navarra in Spain found commonality between people with allergies to peanuts and pine nuts. If you have any nut allergies, check with your doctor before using pine nut oil topically or in cooking. Allergic reaction symptoms may include itchiness, hives, rashes redness, watery eyes runny nose, abdominal cramps, dizziness or vomiting. A 2009 study published in the "Journal of Diabetes Science and Technology" found that when ingested, pine nut produced a feeling of fullness. This lead to a reduction in the quantity of food consumed. Pine nut was found to stimulate the neuronal pathways to the brain that trigger satiation and appetite reduction. The appetite suppressing effect took just 30 minutes to cause a drop in food intake, according to a 2006 study by the American Physiological Society reported in the April 4, 2006 issue of Science Daily. Appetite suppressors signal the brain to diminish hunger and the desire to eat. Some people have reported a bitter taste in their mouth after eating pine nuts. This symptom usually go away by itself in a few moments, but it can lasts for hours.